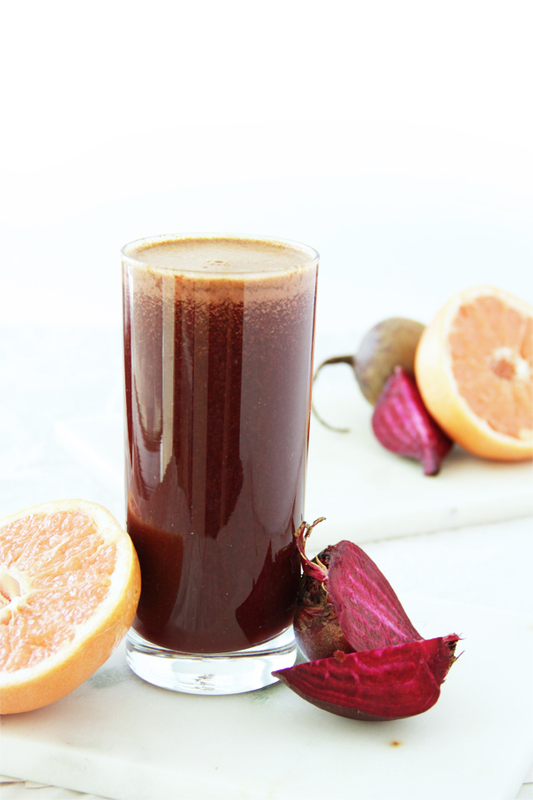 Red Detox juice is a powerful liver cleanser as well as highly nutritious remedy. Grapefruit, apples, a whole lemon, a fistful of parsley, some ginger, all juiced with a couple of beets to create this deep red elixir. 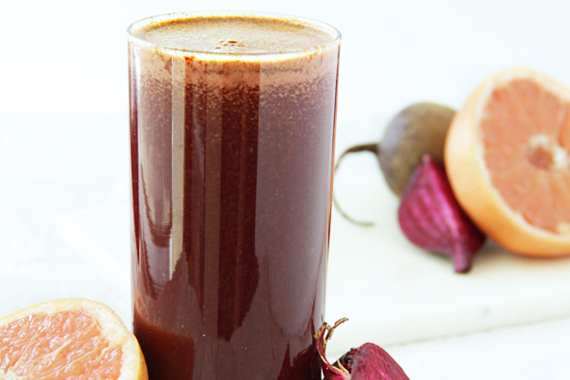 This drink is a wonderful medicine that sends pure nutrients straight to your cells. Drinking this juice is a great way to get your dose of vitamin C, alkalize your system and it also helps to keep things moving. It will speed up digestion, support healing, clear up skin, eyes and overall make you feel more energetic and healthy. Also if you wish to balance your weight, this is a great way to do so. Keep in mind that while detoxing from time to time is a good thing, constant detoxing is not. Balance is key. 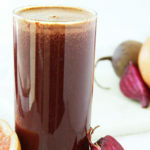 Personally we might drink the Red Detox Juice on a weekly basis during cool months however in the summer we go more for a lighter juice – like a the this one. Beets have been shown to provide antioxidant and anti-inflammatory benefits. Beets can assist in the treatment of anemia, indigestion, constipation, kidney disorders, dandruff, gall bladder disorders, cancer, and heart disease. It also helps to prevent macular degeneration, improve blood circulation, assist with healthy skin care, prevent cataracts and relieve respiratory problems. Beets also contain lutein and zeaxanthin which offer support for eye health. Betalains are the reddish pigments found in certain fruits and vegetables – such as beet root and they assist the body in neutralizing toxins and support the natural detoxification process. 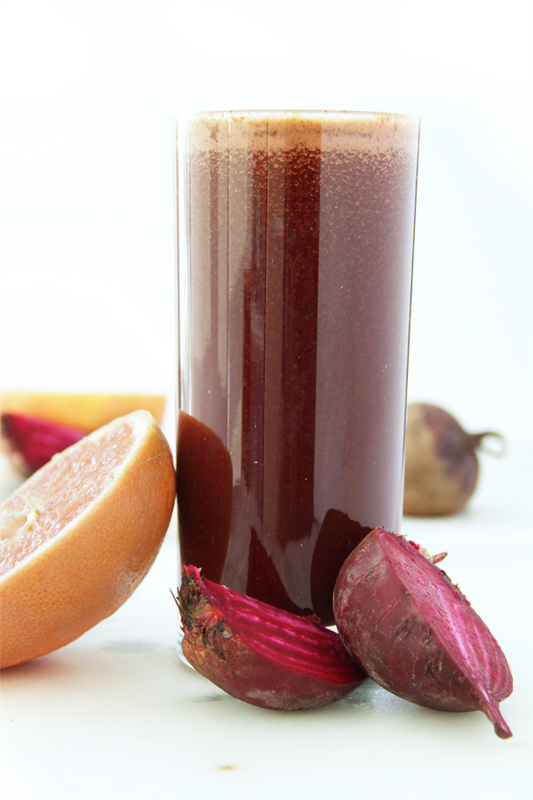 A powerful liver cleanser, this deep red juice hydrates the body while calming inflammation. There’s no need to peel ginger before juicing. Much of the nutrients are in the skin or just beneath. Scrub the root well. If you are new to juicing ginger start with a small piece, see how you like it and gradually increase the dose. Buy organic ginger whenever possible. Cheers! We hope you enjoy it. If you are new to juicing then I would suggest to start with a 1-3 day juice fast consisting of 4-6 juices each day. Mix it up, include some green juices as well, this way you will be getting a variety of high quality nutrients into your body.